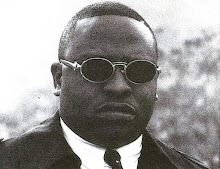 Martin Crawford, better known as De' 1 or Kid Deleon, was a rapper from the vile streets of Houston, TX. Although he is a native of Texas, he does seem to have some strong ties with the East Coast. He first appeared on the song "Flow On (New Symphony)" by Lords Of The Underground. It was this track that made the legendary production team of Marley Marl & K-Def take notice and really see the raw potential of De' 1. With the artist and production team assembled, work would soon begin for a full length album entitled, Day One. 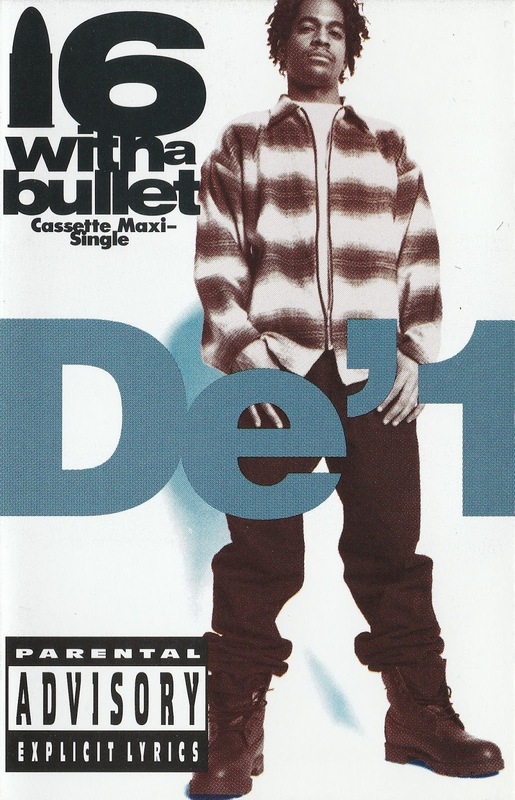 16 With A Bullet is a Maxi Single from the aforementioned album and it was released in 1993 on Reprise Records. 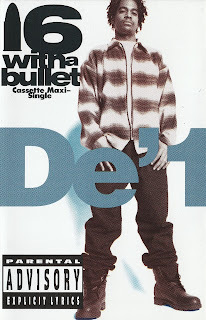 Side A consists of the album and video versions of the song, 16 With A Bullet while Side B contains Da Underground Sound and an alternate mix of the title track. All tracks were produced by the magnificent, Marley Marl who certainly provides some noteworthy hits here. His signature style of heavy bass lines and jazzy horns is used effectively throughout the cassette. His exceptional choice of samples and the smooth use of snares simply cannot be denied. Lyrically, De' 1 can more than handle his own on the microphone. His flow, delivery, pace and technique are on an another level. He is not your typical Southerner in the lyrical department but instead he models his rhymes after his East Coast colleagues. This unique characteristic along with his flavorful demeanor is what tends to set him apart from others. Guest appearances are made by Marley Marl, Lords Of The Underground and Sha-B. Music videos were also recorded for both the single and the B-Side in an attempt to create a buzz around the new artist. True Homies, another single off the album which was also accompanied by a music video, was released the following year in 1994. Then for some odd and bizarre reason, Reprise Records pulled the plug on the entire album. Day One was never officially released and De' 1 was never heard from again. It is truly a shame to see such talent go to waste and a work of art be neglected in this manner. Especially when all the hard work was already done and the album was pretty much completed. The photo and video shoot were done. The singles had been carefully hand picked and leaked out to the public. The promotional material had been passed out to clubs and disc jockeys. Everything was in order, which is why it's confusing that suddenly the parent label would decide to shelve the album altogether. Fans of the underground are still yearning to this day to hear the album in all its' entirety. In the end, not only did this young man represent the city of Houston to the fullest extent in the far regions of the East but he also managed to go blow for blow with some of the best that ever did it. * For the vinyl version of this single, check out the post by Alexandre over at Circuit Power. Hey, i appreciate that you are promoting music, i wish you the best of luck . I would recommend that you post more things to make your blog interesting.